Making My 11th Doctor Costume: Bow ties are getting cooler! 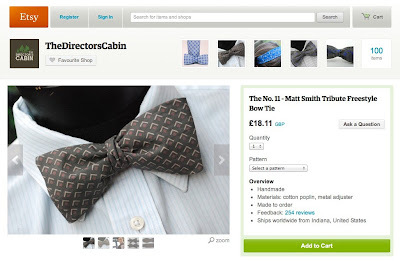 Bow ties are getting cooler! 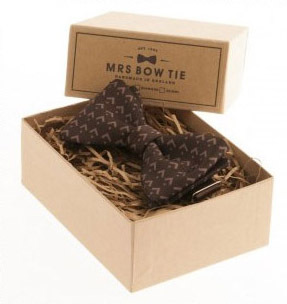 A little while ago I showed you a company called Mrs Bow Tie, who carry a small range of “tribute” Doctor Who bow ties. They are made from printed silk, and although not perfect they are very functional while we wait for a decent woven alternative. Well, a good friend of mine has found another place to get similar replica bow ties from a seller on Etsy.com, called TheDirectorsCabin. They do a range, including Fourth, Fifth, Tenth and the Eleventh Doctors. 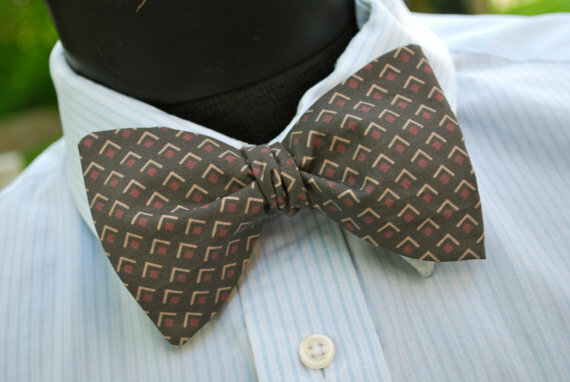 The bow tie is self-tied and comes in two widths as a “batwing” (see above) or “butterfly” (see right). They have an adjuster at the back, so one size fits all. 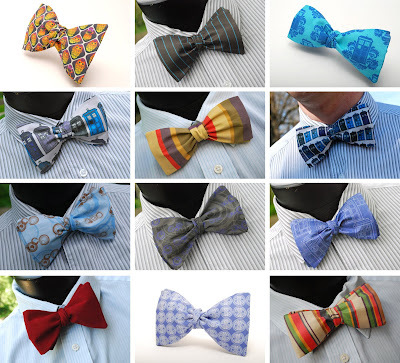 They also do a range of novelty Doctor Who based bow ties, based on a mixture of abstract patterns and replica fabric such as the Tenth Doctor pin striped suit and Fourth Doctor scarf. How do I message you in order to discuss costume purchace, please? And names or sourcing of materials. I think the Mrs bow tie Dr who tribute collection is ok but I must correct what you have mentioned (sorry) just dont want others to be dissatisfied. The fabric is not silk but a polyester which makes me question where in Britain do they buy polyester? So not quite the advocate for britains declining textile manufacturers, overall good for a tight budget or costume wear.